You’ve poured yourself into your project and want to ensure that it exceeds all expectations. The SWOT analysis will help you and your team, identify potential problems, consider new ideas, and think through contingencies. By viewing your project with fresh eyes, you’ll be well positioned to tweak and polish it — so you can be confident that it’s truly top-notch. The SWOT (Strengths, Weaknesses, Opportunities, and Threats) analysis is a classic technique taught in business management courses. It helps you objectively assess your project’s current state as well as its future possibilities, both positive and negative. While it sounds quite elementary, when it’s applied correctly, it results in a deep analysis that positions you to make real-time adjustments to better ensure your project’s best possible outcome. The S of your SWOT analysis is figuring out your strengths—the internal assets you have in your arsenal. These assets are the backbone of your project and play a key role in strategic decisions. By knowing your company and project’s strengths, you can leverage them to the maximum possible degree. Start with your team members. What does your team excel at? What unique training and experiences are they bringing to the table? Is one person great at organizing tasks? Does another have an exceptional ability to negotiate or a knack for communicating with vendors? Then move on to your business: What is your product or service’s unique selling proposition (USP)? What is your company’s brand identity? Regardless of the nature of your project—even if it’s an HR initiative or the implementation of a new accounting system—it’s affected in big and small ways by what your company is selling. Remaining mindful of the unique strengths of your product or service helps ensure that your project remains aligned with the goals of the overall organization. After taking some time to catalog the internal advantages that you can leverage, it’s equally important to pinpoint the internal disadvantages—the W for weaknesses—that stand in the way of your project’s success. This isn’t about making a list of gripes and complaints. It’s about objectively assessing the challenges and hurdles your team will be facing. Some weaknesses are rooted in company-wide issues such as management problems, poor internal communication, lean marketing budgets, outdated websites, or reputation. Other challenges are project-specific. Does your team need additional training? Would a consultant be helpful with a specific aspect of implementation? How is your support staff? Do you need more of them? Are project costs putting you on course to exceed your budget? Do you lack key technology? Once you have identified critical internal weaknesses, you can divide them into two lists: those you must accept and those you may be able to change. Company-wide issues are often out of your control. However, by understanding the scope and impact of these issues, you and your team may be able to anticipate and minimize adverse effects on your project. Listing and prioritizing weaknesses in order to consider potential solutions is one of the most important aspects of the SWOT analysis. Project-specific weaknesses are often within your control, at least to some extent. While some of these problems may require approaching your senior management about altering the project’s budget, timetable, or expectations, doing so may drastically increase the chances of project success. After examining internal strengths and weaknesses, it’s important to assess how external factors could potentially influence project outcome. 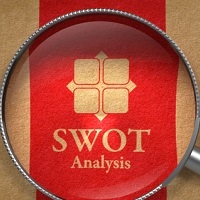 Begin by scanning for untapped opportunities—the O in SWOT. External opportunities range from new market trends, technological upgrades, geographic expansion, cost reduction, or even just collaborating with external networking contacts to identify new vendors or customers. This segment of the SWOT analysis is a great team-building tool. Get your people brainstorming together, and give them license to get really creative. You might be surprised to discover new opportunities that will take your project to the next level. Finish off your SWOT analysis with the T for Threats. External threats are different than internal weaknesses, especially because they can be harder to recognize or anticipate. They not only derail projects, but also they can threaten the stability of your entire company. These threats come in many forms, including fluctuating markets, superior competitors, technological challenges, or even natural disasters. While you can’t guard against all these threats, you can be aware of their potential and proactively make adjustments to your project as needed. For example, if airline ticket prices are skyrocketing, you may need to cancel some face-to-face meetings in favor of video conferencing with screen-sharing. Or if a competitor has created a far superior program, you may need to talk to your senior management about altering your project plan. Scanning for and understanding external threats is vital to ensure that your team remains vigilant and responsive to anything that could be a detriment to project success. The SWOT analysis should not result in lists of weak, vague intentions. Nothing will frustrate your team more than wasting time spinning their wheels coming up with ideas that never come to fruition. Instead, use this tool to create specific, measurable, and staffed action steps. This prevents the SWOT analysis from merely being an intellectual exercise and ensures that it does what it is intended to do—help you and your team make vital course corrections so that your project exceeds all expectations.